What’s better than listening to four fabulous women’s choirs on a Sunday afternoon? When it’s free, of course!! 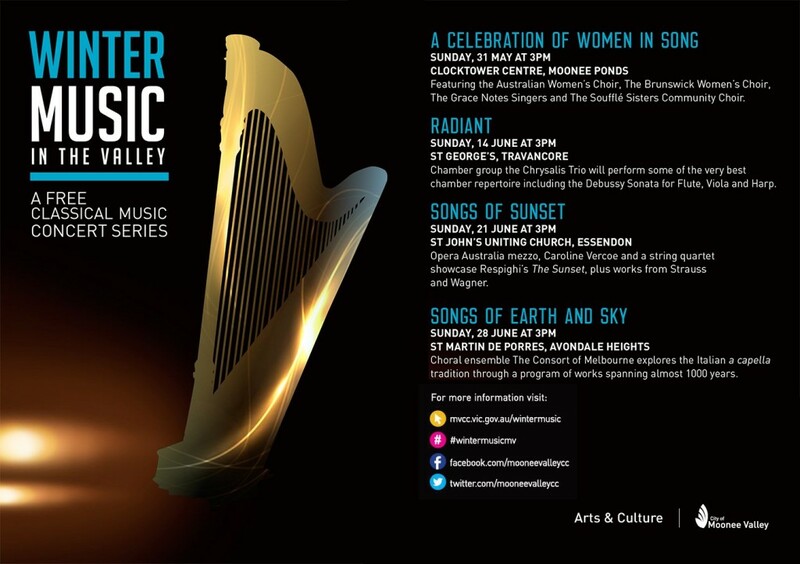 We are performing this Sunday, 31 May as part of Winter Music in the Valley, an exciting series of four concerts in Moonee Valley. Come and listen to us open this hour-long performance at the Clocktower Centre. 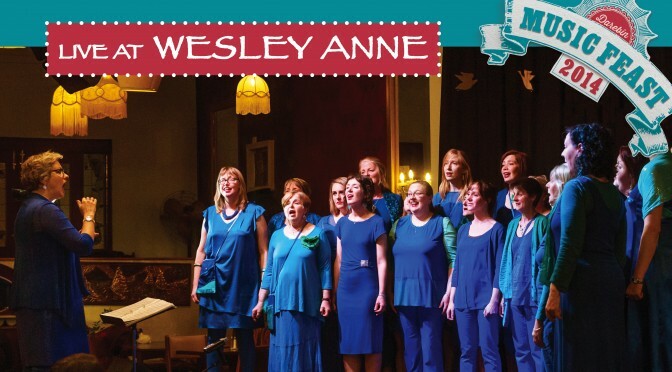 Also featuring the Australian Women’s Choir, the Souffle Sisters and Grace Notes. No tickets or bookings are required. Doors open at 2.30 for a 3.00 start. Find out more. 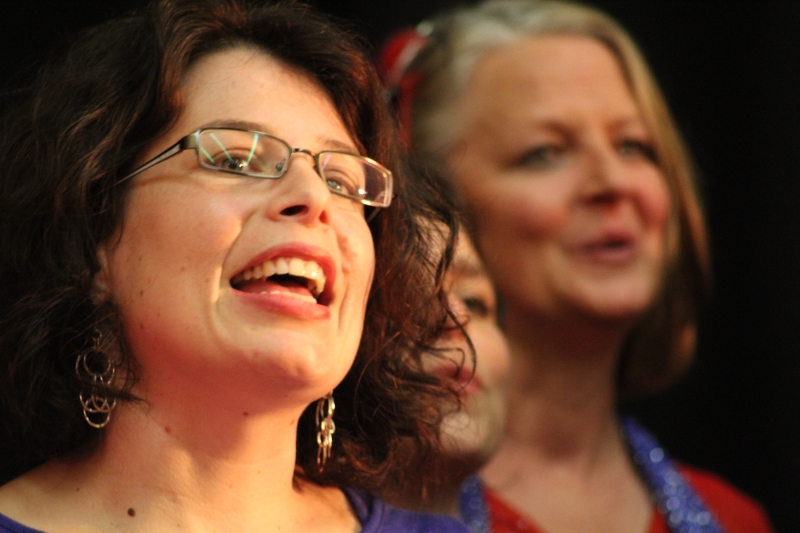 Bring your picnic and best singing voice to join Brunswick Women’s Choir and many other wonderful performers for Darebin’s free annual Carols in All Nations. BWC will be singing at 7.15pm. 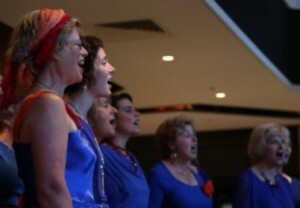 If getting to Darebin doesn’t suit you then Brunswick Women’s Choir will also be performing at City of Moreland’s free Carols by the Lake at 9.30pm. Hot off the heels of our sell-out Spotted Mallard performance, we’re taking this show to the Wesley Anne on Sunday 19 October for the Darebin Music Feast. The stellar repertoire has something for everyone: from a Paul Kelly classic, to a Ben Harper anthem to a Latvian song of revolution. Some of our new members will join us for their debut performance. So if you missed tix to our Spotted Mallard gig, book now for the Darebin Music Feast encore! Tickets: $20 / $15 / $10 for general admission. See further article by Lionel Lee in Weekendnotes. Brunswick Women’s Choir, the Souffle Sister’s and renowned Adelaide women’s choir Allegria invite you to an afternoon of fun and singing! Our workshop kicks off at 2pm followed by a combined concert at 4.45pm featuring performances from BWC, Souffle Sisters and Allegria and culminating in all participants and choir members on stage to perform the newly learnt songs. This August, the Brunswick Women’s Choir embarks on an exciting and unusual collaboration with multi-disciplinary artist Jess Olivieri. ‘May I suggest’ will be a series of unique performances for the Melbourne Art Fair. Jess creates work that spans performance, sound, video, dance and installation. Her practice is concerned with the social and cultural factors that influence how we inhabit public space. ‘May I suggest’ will be the second in a series of works with women’s choirs. The first, ‘Hello’, welcomed visitors into the somewhat foreboding architecture of the new wing of the Museum of Contemporary Art Sydney. ‘May I suggest’ will take one of our favourite songs and use it to suggest new worlds of possibility to collectors. Schedule your visit to the Melbourne Art Fair for any of the times below to be part of this adventure. Book now for any day of the Fair. As part of this conference, Positive Women Victoria have developed an arts project to raise general awareness about women living with HIV, with a stunning photographic exhibition accompanied by the publication A Body of Knowledge. 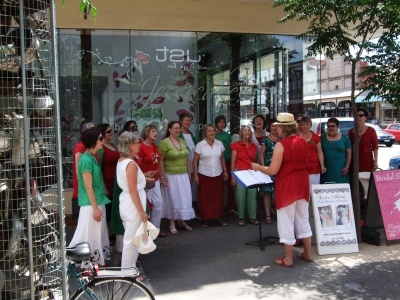 The Brunswick Womens Choir will be helping PWV celebrate the opening of the exhibition on Wednesday 23 July at 7pm. We’re lifting song to new heights with our 2014 annual showcase event, Worlds Above and Worlds Below. It’s sure to be a moving show – we’re debuting several new pieces to complement some old favourites. This year we’ll be performing at a fresh new venue, the oh-so-Brunswick Spotted Mallard! Tipple and nibbles will be available to purchase during the show. And we encourage you to join us for dinner and drinks after. Contact The Spotted Mallard directly for table bookings and dinner reservations. Seats are limited, so get in early to avoid missing out! BWC hit the Big Apple! What a way to celebrate International Women’s Day: joining forces with 197 women from eight countries, to sing songs written by women and in celebration of women! 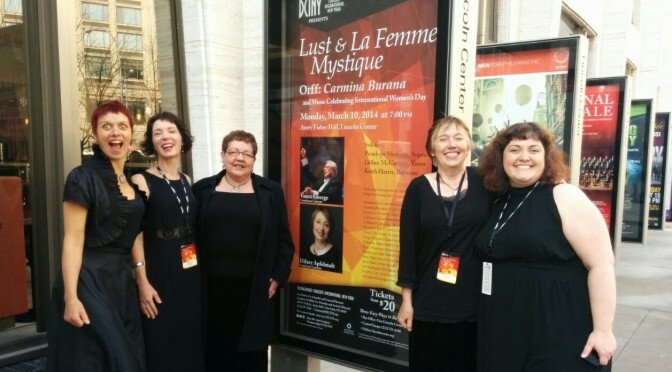 That’s exactly what 15 members of BWC did in March… and at the Lincoln Centre in New York, no less! The journey began late last year, as the group met many times to rehearse nine very challenging songs, all quite different from our existing repertoire. Once in New York, there were two intense rehearsals to polish the work. And then it was off to the Lincoln Centre. The excitement at using the artists’ entrance built to fever pitch during dress rehearsal. But nothing could compare to the thrill of delivering a stellar performance to a packed house, with women from all around the world. 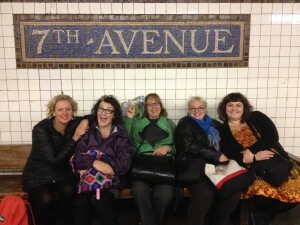 And of course, having traveled all that way, the women needed to squeeze every drop out of the Big Apple! Sightseeing, shopping, singing and shows … and more than a few cocktails! A trip never to be forgotten. On the two Saturday mornings leading up to Christmas you might be lucky enough to capture the delightful melodies of Brunswick Women’s Choir when they pop up in various locations along the Sydney Rd shopping precinct to sing for the shoppers and passers by.